It was never a secret the San Francisco 49ers were ready and willing to throw resources — be it cash, draft picks or a combination of the two — at fixing what they view as the team’s biggest weakness: an outside pass rush capable of closing out tight games. In coach Kyle Shanahan and general manager John Lynch two years in charge, the 49ers have lost a whopping 11 one-possession games. On multiple occasions, a sack that forced a fumble or a hurry that led to an interception might have been all that separated the Niners from victory. Assuming there are no snags, the 49ers finally have the dynamic edge rusher that has been missing since Aldon Smith departed in 2014. Looking back at Smith’s all-too-brief time as a Niner is cause for disappointment now but was transformative at the time as he piled up 42 sacks in his first 43 games. The Niners’ hope is Ford can supercharge their defense in a similar fashion. While it took Ford a while to have a true breakout season, he did it in a big way in 2018. He finished with a career-best 13 sacks and tied for the league lead with seven forced fumbles last season and Pro Football Focus rated Ford as its top outside rusher, crediting him with 78 pressures. Of course, that doesn’t mean Ford comes risk-free. 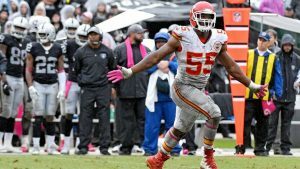 While his 2018 season was a big one, it was also only the second time he’d posted more than four sacks in his five seasons with the Chiefs. In 2017, Ford played in six games because of a back issue that required surgery and he also played through injury issues in 2016. The other question is where Ford will fit in San Francisco’s defense. He has spent his entire NFL career in a 3-4 defense as an outside linebacker and a primary reason Kansas City reportedly wanted to trade him was because it was unsure how he’d fit in new coordinator Steve Spagnuolo’s 4-3 scheme, particularly against the run. While San Francisco runs a different defense than Kansas City, it’s fair to wonder how Ford will hold up against the run and whether the Niners envision the 252-pound Ford as more of a strongside linebacker or a “Leo” defensive end. One way to help solve that and still maximize Ford is for the Niners to continue to invest in the outside pass rush. In fact, while a cursory glance at the trade for Ford might lead some to believe the team will put valuable draft resources elsewhere, it might actually be the setup to another big addition. Previous Post: Browns all-in for Super Bowl after trading for Odell Beckham Jr.